Pat and I are getting settled into our new place and it has a gorgeous living room that is just begging for a party! 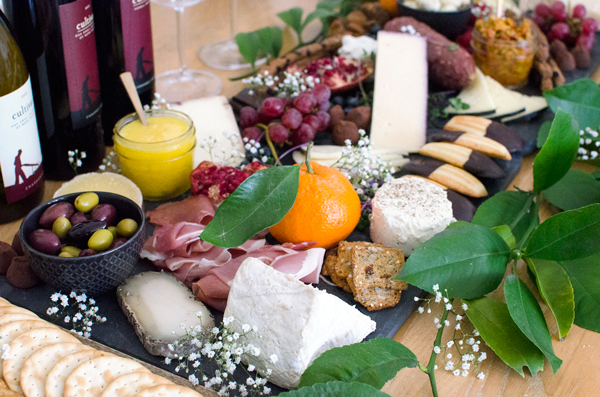 I’m not quite in the “throw a huge multi-course meal mode” due to needing a few more things to make our place perfect, but I’m definitely in “put together a gorgeous spread of wine and cheese mode”. 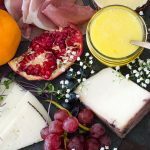 I just wanted to share a few photos of the fancy cheese platter I put together and share some tips on how I put together the spread. Because I can never just keep things simple, read on to also find a recipe for an amazing lemon curd recipe as well as a bit about Cultivar Wine in Napa, which is our new favorite place to get wine from! Decorations :: First, I have to say that a bit of greenery goes a long way! You don’t necessarily need anything fancy – the leaves you see above were just some branches I picked from the lemon tree in our backyard! I also picked up a bouquet of cheap-o baby’s breath and microgreens at a local grocery store to stick in here and there. My favorite place to get roses is Trader Joe’s as you can get a bouquet of 8 roses for around $6! I also put a pretty potted black calla lily on the table. We put everything on our dining table from MoveLoot and I used two West Elm slate placemats and a pretty wooden cutting board as our platters. Some of the spreads I put in teeny mason jars. Cheese :: I figured this was my chance to go crazy and get a whole bunch of cheese! I definitely went overboard, which was fine by me because it meant I got to eat my favorite meal of cheese and crackers for dinner the next few nights. 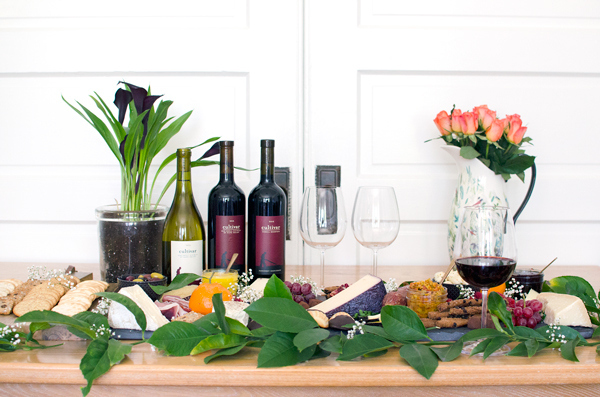 Wine :: I wanted to go with local wine, so I served Cabernet Sauvignon and Sauvignon Blanc from Cultivar Wine. 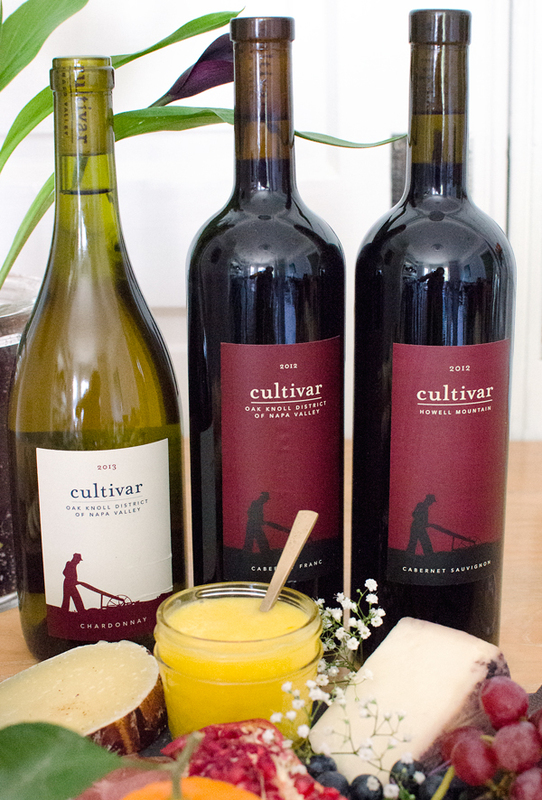 Cultivar is a family-run winery in Napa Valley, California. 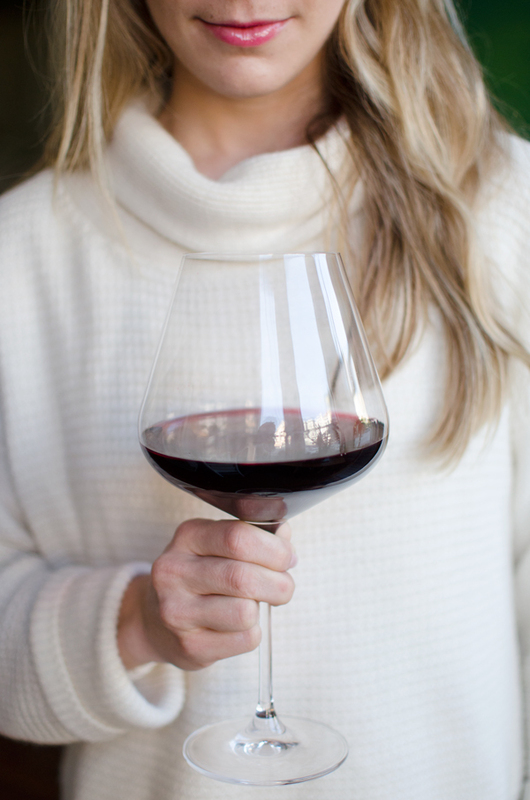 They make their wines from some of the best grapes in Napa and it shows – when we opened our first bottle I almost fell over! This wine is some of the best I’ve had in California, even with all the trips to wine country that we’ve made since we moved here! I think it was one of the highlights of the night – our guests kept commenting on how good it was! Cultivar strives to be delicious and high quality, but still accessibly priced! 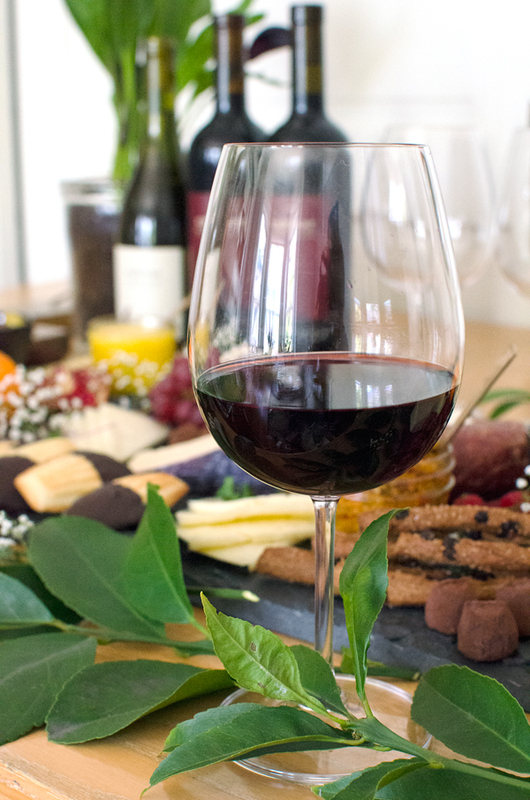 We joined their wine club to make sure we try all of what they have to offer. 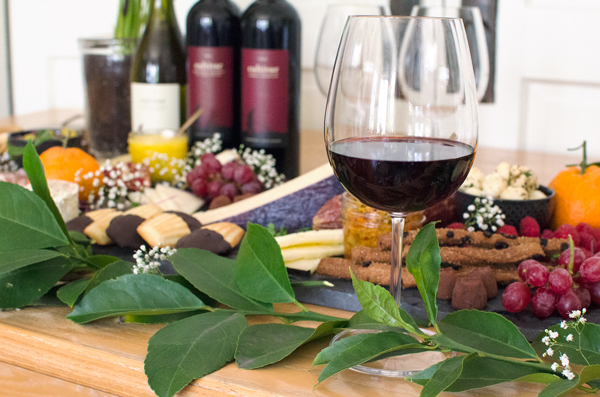 Plus, wine club members also get 20% off wine purchases. Fear not, if you’re outside of California they still may ship to your state. 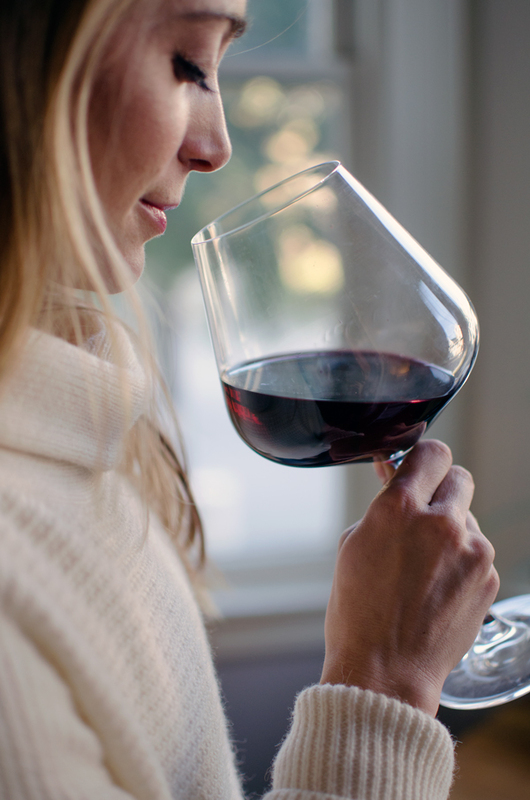 If you want to try Cultivar wines for yourself, Cultivar is offering 10% off for A Side of Sweet readers! Just use the code ‘CultivarWineASideofSweet‘ when you place your order. Crackers :: Trader Joe’s is the clear winner for crackers. 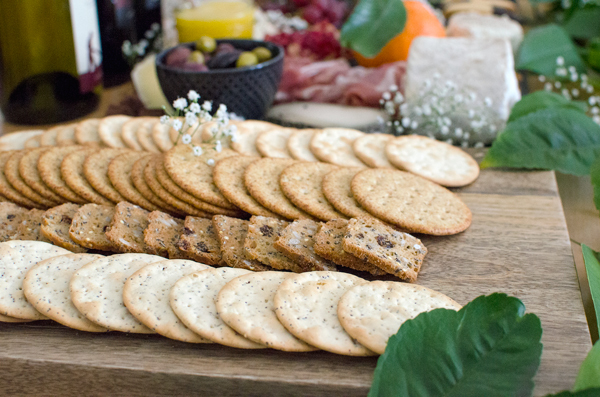 I got a party assortment that you can see below as well as one of my favorite party starters – Raisin Rosemary Crisps. If you haven’t had them – get them. They are the perfect pairing for soft cheese and any cheese that is a little on the sweeter side. I only spent about 5 bucks on crackers thanks to TJ’s! Other :: I picked up some madeleines, prosciutto, olive tapenade, dried figs, chocolate truffles, and grapes from Trader Joe’s and some organic berries and olives at Whole Foods. I also coarsely broke up a pomegranate, mostly because it was pretty and not because I expected anyone to eat it (which was a correct assumption!). Same thing with the unpeeled satsuma mandarins. I also included a smattering of nuts, homemade jam and some of my dad’s honey! Lastly, I made some homemade lemon curd using lemons from our backyard tree. The gorgeous yellow color was definitely a showpiece. The recipe for the lemon curd is below! Thanks so much for reading A Side of Sweet! For more Sweet in your life, you can find me on Instagram, Pinterest, Facebook, YouTube, Bloglovin’, Snapchat(@asideofsweet), or Twitter, or subscribe to receive a weekly email with new posts (see sidebar). The perfect tart and sweet lemon curd recipe that goes great on yogurt, crackers or just by the spoonful! Create a water bath by filling a medium saucepan with 1 inch of water and bring to a simmer. In a heatproof bowl, combine the egg yolks and sugar and whisk until smooth, about 1 minute. Zest and juice the lemons. You should have about 1/3 cup of juice. Add a little water if you need more liquid. Add to egg mixture and whisk until smooth. Add the bowl on top of your pot of boiling water and whisk until it becomes thickened and light yellow, about 8 minutes. It should coat the back of a spoon. Remove from heat and add butter pieces one at a time. Stir until melted. Strain lemon curd through a fine mesh strainer (optional) to remove large zest pieces. Serve warm or refrigerate for up to 2 weeks. If storing, cover the surface with a layer of plastic wrap to prevent drying out. 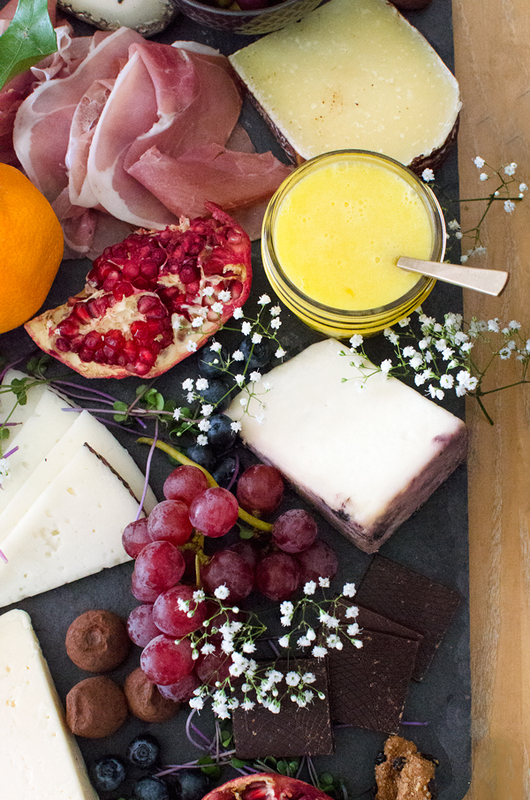 Tell me, do you have any tips for making the perfect cheese platter? OMG I pinned this yesterday because it looked so beautiful! I had no idea you created it, you’re very talented with the ol’ food decoration. Love the still life composition and that large glass is dreamy! Awesome! Glad to hear it caught your eye! It is a bit like a still life, isn’t it!? I’m all over the Mt. Tam cheese right now. Sad I wasn’t there to eat it all! 😉 Hope you had a lovely cheese-filled evening in the new place. Ditto! It was such a fun night! Lovely spread! Thanks so much for the tips. 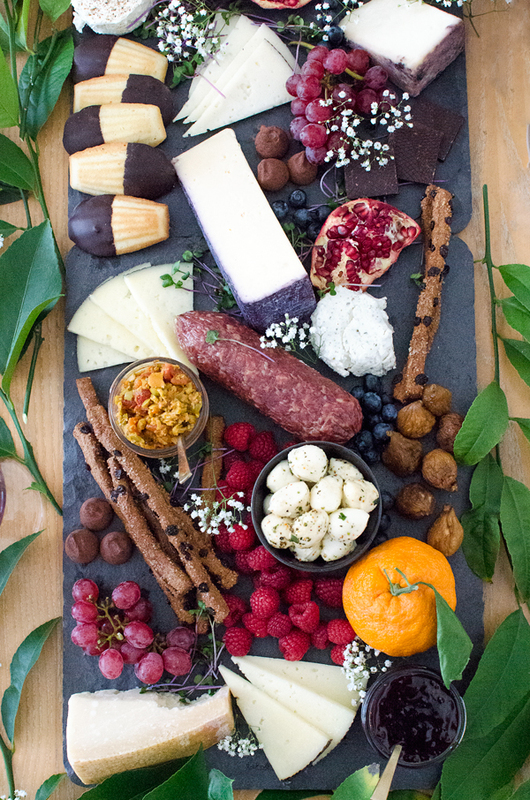 Wow, that’s so much more than a cheese platter! I’m coming to your house! Thanks Amanda! I wholeheartedly agree with that! I love them all too! 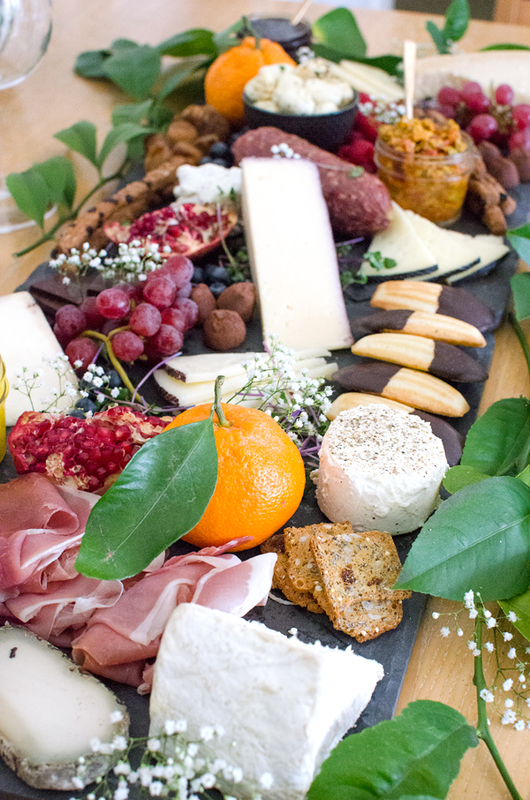 You should definitely do your own…even if you skip all the extras and just throw some cheese blocks on a platter!